For fans of urban industrial design, this chair steals the show. 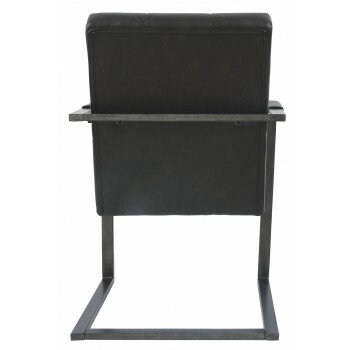 Chair’s metal C-frame in a blackened gunmetal finish is sleek, sculptural and ultra modern. Crafted for looks and comfort, the tufted boxed seat, wrapped in a “weathered” faux leather upholstery, is loaded with retro chic flair. Whether paired with Starmore’s home office desk or dining room table, it’s a feast for the eyes.